I saw Peter Greenaway's "Rembrandt's j'accuse" at the Film Forum on Sunday, with Carol. A very interesting (if, perhaps, slightly over-fussy) film, one that does get you thinking about "visual illiteracy" and how much you don't see in paintings. 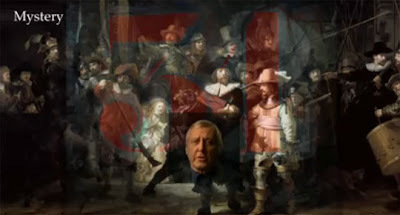 For those unaware, Greenaway contends that Rembrandt's so-called "Night Watch" contains clues to a contemporary murder conspiracy as well as "naming" those involved. I admit, my first instinct was to fear a Dan Brownian type of overwrought plot but, if he stretches things here and there, he also presents compelling evidence even if I wouldn't be at all surprised to learn of art historians who think he's gotten it entirely wrong. Yes, the visuals get a bit annoying, the overlapping scrims, Greenaway himself appearing throughout in a little square mid-picture, etc. Though often, too, via digital manipulation, he's able to isolate elements to make the (his) interpretation all the more clear. But, more importantly, it makes you want to examine other paintings more closely, imparting the suspicion that you may have been missing a lot all these years. He shows Velazquez' "Surrender at Breda" and, of course, "Las Meninas", both of which have been studied to death but maybe deserve even more insight. I'll be very interested if Greenaway turns his sights there or elsewhere in the future.